The student gets high scores on the LSAT PrepTests. The student feels good. The student feels confident. One: A proctor who strictly times you by telling you when to start and stop, who screams out the five-minute warning, who is always in your presence, and whose eyes burn right through you as you are take this important test. Two: The feeling of the test being the “real deal”: being read the instructions before the test starts, having only thirty seconds between sections, being allowed only a strict ten-minute break between sections three and four, having to wait for the proctor to collect test materials and ID’s before and after the break, and taking the writing sample. Wasted time and frustration are not the only concerns. With courses costing hundreds to thousands of dollars, not to mention the high fee that it costs to merely sit for the LSAT, money is at stake too. to score high on test day, you need to practice under actual conditions. 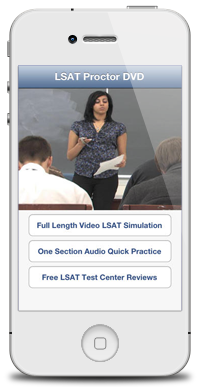 The LSAT—India Invigilator App will help. Push play once to easily time all sections of your full-length LSAT-India PrepTests, including the experimental section and writing sample. Practice timing yourself with the analog watch that you will use on test day. A realistic simulation of test day, including an invigilator who reads instructions and test-day procedures. You will know exactly what to expect on test day, reducing your anxiety and boosting your confidence. Distractions Mode simulates noise from other test takers. This increases your concentration by helping you build tolerance to distractions that could lower your score. Can be disabled on iOS version. iOS App (iPhone, iPad, iTouch)The iOS version is perfect for on-the-go practice. Once downloaded, you don't need an internet connection to use it. You can jump to any particular section and can turn distractions on and off. Streaming on Any Computer or Mobile DeviceWhen you purchase this version, you will receive a link via email to the streaming video, which can be played on your PC, Mac, or any smartphone, including Android devices. You can stream the video as many times as you like.